Hundreds of scholars gathered at Pepperdine University June 16-18 for the 31st annual Christian Scholars' Conference. In between lectures, excursions, panel discussions, and more, plenary speakers and internationally recognized thinkers reverend John Polkinghorne and Ted Peters sat down with Craig Detweiler, director of the Pepperdine Center for Entertainment, Media and Culture, to discuss the perceived gap between science and theology. 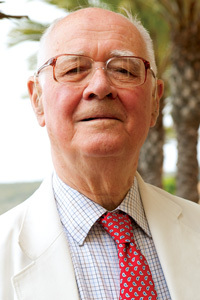 Reverend John Polkinghorne is the founding president of the International Society for Science and Religion and one of the founders of the Society of Ordained Scientists. He is internationally recognized for his contribution to the study of theology and science, and he has published several books that combine his two areas of expertise—theological inquiry and scientific investigation. He was elected Fellow of the Royal Society in 1974 and Knight Commander of the Order of the British Empire in 1997. He was awarded the Templeton Prize for Science and Religion in 2002. DETWEILER: There’s a tendency to put science and faith in opposition to each other; a lot of people feel they have to make a choice. yet, Dr. Polkinghorne, in your presentation at this conference you talked about the different questions that science and faith can answer. POLKINGHORNE: Yes, I think that science and religion are friends and not foes. And they’re friends because they have the same basic orientation; they’re both seeking the truth and looking for truth through motivated beliefs. But, of course, they’re looking for different dimensions of the truth. Science is asking the question of how things happen in the world, which is very important, but it makes its progress by bracketing out other questions, such as meaning and value and purpose in what is going on. Those are the sort of questions that religion is able to address. I think in order to see the whole scene we need the insights of science and the insights of religion. I like to say I’m two-eyed; I see the world with the eye of science and the eye of religion, and that binocular vision allows me to see further and deeper than either eye would on its own. DETWEILER: Dr. Peters, as a theologian you’re educating the next generation of pastors and yet you don’t fear this kind of scientific inquiry. How do you put those things together? PETERS: No, I don’t fear scientific inquiry. In fact, I celebrate it. I read Science and I read Nature, and when they announce a new discovery I get all excited about that. This creation is big and it’s beautiful and it’s magnificent, and the scientists in some ways are the revealers of what’s going on. I noticed when you opened you said ‘There’s a perceived split between science and religion.’ yes, when journalists try to write articles, they want to play up the fight, but deep down, have you ever found a Christian who says, “I don’t like science”? I don’t think they exist; the same with our Jewish brothers and sisters. We all love science, so if there is a battle, it’s really not that somebody is opposed to science. They might have a battle over an issue, but it’s not really healthy to describe it as science versus anti-science I think. Ted Peters is a professor of systematic theology at Pacific Lutheran Seminary in the Graduate Theological Union in Berkeley, California. 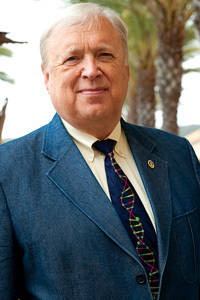 He served as the principal investigator for the National Institute of Health project on “Theological and Ethical Questions Raised by the Human Genome Initiative.” He has written books on genetics, issues of social justice, and the stem cell debate. Peters is also a Lutheran theologian and an ordained pastor in the Evangelical Lutheran Church in America. 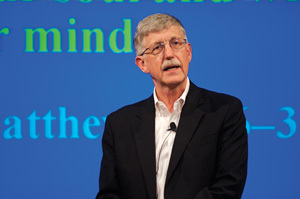 DETWEILER: Francis Collins was with us yesterday and spoke extensively about evolution. Darwin obviously has been branded with a broad brush. Reverend Polkinghorne, in England the battle hasn’t been drawn in sort of the same kinds of ways. POLKINGHORNE: No, when an Englishman comes to North America it’s a slightly baffling scene. There are, of course, fundamentalists of one sort or another back at home, but they’re not by any means as visible as they are in this country, and it saddens me to see a country where there are many believers who, I think, are sincerely seeking to serve the God of Truth, but who reject the truth that science can offer. It doesn’t offer you the whole truth, but it can offer you some of it, and we should receive that with gratitude and respect, not with fear and trembling. PETERS: The battle that happens in North America is almost always— correct me if I’m wrong—over evolution. I’ve never heard anybody fight over chemistry, or mathematics, or physics. Can you imagine a chemist coming home after a day at the laboratory saying to his wife, “Oh, I’ve just had an experiment today that’s shaken my faith.” I mean, it doesn’t happen. The real battle is over Darwinian evolution and that appeared, in the history of books, in the late 19th century. It’s had enormous ramifications for the authority of the Bible, and the support for capitalism, for example, comes from Social Darwinism. There’s a battle going on, but usually those people who are opposed to Darwinism are not necessarily opposed to chemistry, physics, and mathematics. DETWEILER: With the advent of the Internet, we’re overloaded with information, particularly with scientific information, and it’s hard to keep up with so many studies and issues of ethical decision making. How do we navigate this brave new world? POLKINGHORNE: I think we have to navigate it in two steps. We have to rely on the experts to tell us what the options are; what can be done and what might be the side effects of doing it. But once they’ve done that, their role is finished. They’re not judges in their own cause. Then it’s for the ethically responsible public to seek to decide not only what can be done, but whether it should be done—that’s the critical question. We need to try and do that, if possible, before the technology is finally on the shelf. PETERS: That’s actually a circular relationship to some degree because the public is going to decide what the government is going to fund and not fund, so there needs to be an interaction between the experts on one hand, and you and I, who make a contribution to public policy, on the other. DETWEILER: What role does a Christian university like Pepperdine play in this discussion that we’re having on science and religion? POLKINGHORNE: I think the university plays the role of standing for the unity of knowledge. Universities are not just loose federations of individual research institutes. They are seeking the truth in the widest possible context and the deepest possible way, and that’s a very important role that universities have to play. PETERS: I like what John said about the unity of knowledge. They’re universities not “multiversities." And the Christian mind has, from the New Testament on, always been an inquiring mind. It’s no accident that Western Europe gave birth to natural science the way it did. Saint Anselm and others have said that the Christian faith seeks understanding, and through understanding our appreciation for God’s creative work in this universe grows and grows. The university should reflect that. This intersection of faith and science was explored in numer- ous presentations and panel sessions over the course of the conference’s three days. As the Robert E. and Bonnie Cone Hopper Plenary Speaker, Collins engaged with a packed audience in Elkins Auditorium, Malibu, as he shared his journey from atheist college student to Christian scientist. He spoke of how he “embarked on a path of discovery” that led to a Jesus-centered epiphany wrapped in a scientist’s need for burden of proof, which he found in the complexity and consistency of physical laws. He explained his theological and scientific conclusions at the conference, including evidence he found in support of theistic evolution through his research as a leader of the Human Genome Project and founder of the BioLogos Foundation. 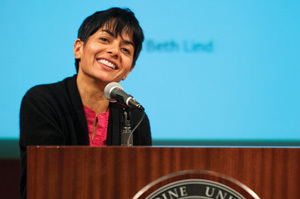 Rounding out the quartet of plenary speakers was Emmy Award-winning journalist and University of Kansas professor Simran Sethi, who presented an in-depth exploration of the ethics of modern, globalized eating practices in a lecture titled, “Our Daily Bread: Food, Faith, and Conservation.” Laying out some grim statistics about the likelihood of dramatically rising food costs that will cause millions more people to go hungry, Sethi also shared the economic and physical impact of genetically modified crops and pesticide use, particularly on the struggling farming communities that are so heavily exposed to pesticides. Amid lively panel discussions and thought-provoking luncheon debates, another highlight of the conference included a live episode recording of the Tokens Radio Show, featuring socio- political satire, best-selling authors, and award-winning artists such as singer Odessa Settles, Brother Preacher, musicians Andy Gullahorn, and Our Most Outstanding Horeb Mountain Boys; as well as a special appearance by actor Hal Holbrooke as Mark Twain. 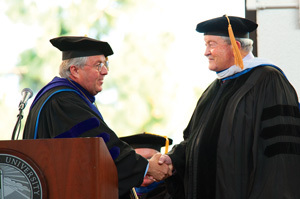 Thomas H. Olbricht receives an honorary doctorate from Pepperdine University. At a dinner and ceremony held on the final night of the conference, June 17, Pepperdine conferred an honorary doctorate degree upon Thomas H. Olbricht, Distinguished Professor Emeritus of Religion at Pepperdine. Olbricht founded the Christian Scholars’ Conference in 1981; since then the conference has been hosted by several universities associated with Churches of Christ. Henceforth, the annual event will be called the Thomas H. Olbricht Christian Scholars’ Conference, starting with the 2012 conference at Lipscomb University in Nashville, Tennessee. Olbricht has been a minister in Churches of Christ for over 50 years and an elder for more than 20. He notes that this year’s attendance was record-breaking in the history of the conference, illustrating a deep enthusiasm for the annual event. “The success of CSC demonstrates Pepperdine’s maturity as a center of intellectual and spiritual ferment,” he adds.